A couple of weekends ago we were invited to Parkwood Outdoors Dolygaer on a blogger’s weekend of outdoors adventure. Now, if you are a regular reader of this blog you will know that I’m not the outdoorsy type! But Bean, my eldest is really fun and adventurous and I knew that she would love the weekend so I did what I always try to do – I say yes to most things. I open up our lives to new experiences and I live by the motto that you can only regret the things that you don’t do. And boy can I tell you I was glad I said yes to this opportunity! Parkwood Outdoors is located just outside Merthyr Tydfil in an amazingly beautiful location. Seriously the views were out of this world. We arrived on Friday evening and were made to feel very welcome. We were shown to our chalet bedroom which we were very pleased with. It was basic but with everything we needed including a wardrobe, a warm bed and blankets and an en-suite shower room and toilet. Upstairs in the chalet was a communal lounge and kitchen which was well equipped and very comfy. I’d happily stay there again. We headed over to the main building to meet the other bloggers who were there for the weekend. I was quite worried when I saw that they were all very outdoorsy types but they were so so lovely and we had the best time with them. Bean was the only child there but she was really embraced into the group and made to feel very at home and welcome. We were treated to a really lovely proper dinner. Parkwood Outdoors Dolygaer have their own chef, Damien, and he certainly knew his stuff! The food was delicious and plentiful and there was coffee / tea / hot chocolate on tap too. After dinner the centre manager Mike gave us a little presentation about the centre and their plans for it. Parkwood only took over the site just over a year ago and have already made massive improvements. They have upgraded all the equipment, renovated the buildings and invested a lot of money and time into making the centre into a real destination. The passion that Mike and Owen (Activities Manager) have for the centre is wonderful and they are brilliant instructors too as we were to find out! The next day we were up early for breakfast which was a veritable feast! Cereals, milk, juice, coffee, tea and a full cooked were available to us if we wanted it. We tucked in knowing that we had a busy day ahead of us. We were then suited and booted in our wetsuits, float aids and helmets and off we went on the minibus for our first adventure gorge walking. The centre provides all the equipment you need so all we brought with us were suitable footwear and swimwear for under the wetsuits. I’m not going to lie to you, I thought I was going to be freezing doing gorge walking and I wasn’t really looking forward to it. When I’m on holiday I won’t go in the sea unless it is as hot as a bath so I didn’t want to think about the temperature of a gorge in Wales in October! You probably won’t believe me but it was fine – more than fine actually I was very comfortable! The wetsuit did it’s job I guess and because we were moving about a lot I didn’t feel the cold at all! Gorge walking was an absolute blast! Mike, Owen and Tony were brilliant instructors and made me feel really at ease. They assured us that they would be there to help at all times and there was always an easy route to take if we wanted to (the chicken route!!). I was especially impressed with how well they looked after Bean, they took really great care of her and I knew she was really well looked after which is so important. We walked, swam, climbed and jumped off some incredible rocks, through fierce currents and made it out alive. It was exhilarating and if you look at the photos the grins on everyone’s faces show just how much we all enjoyed it. Oh and Bean was in her absolute element. I don’t think I’ve ever really seen her like it, she came alive and loved every minute of it, showing no fear at all! Feeling on top of the world we headed back to the centre for lunch which was again a real treat – a massive buffet which was sure to keep us going for the afternoon. We stuffed our faces and headed out again – this time stand up paddle boarding, another thing I hadn’t tried, although lots of people had told me how hard it was! 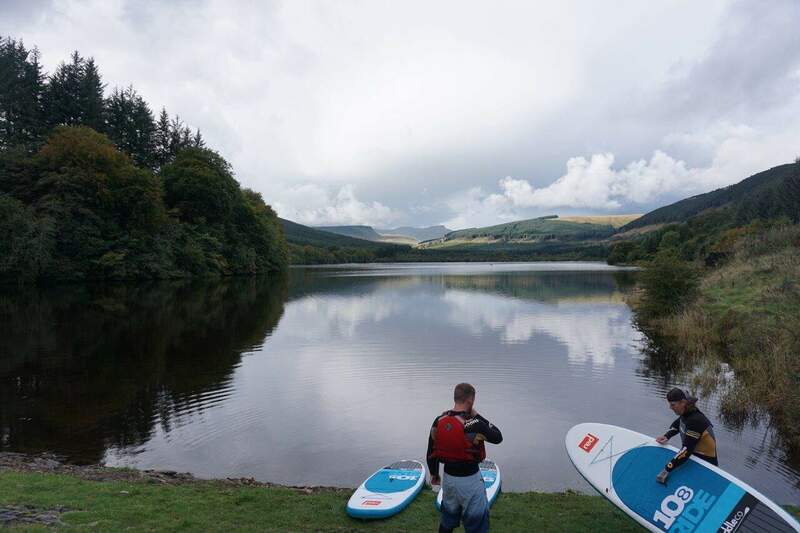 The centre has plenty of paddleboards and a giant one for everyone to hop on! They taught us how to use them and let us free to have a go – under their watchful eye. All of us managed to stand up and paddle along which was something – and yes all of us did fall in at one point or another but that was half the fun! We took it in turns in groups on the giant board and were given some fun activities to try, it was a real blast! Bean again absolutely loved it and wanted to stay in the water forever I think! Parkwood Outdoors Dolygaer offers all sorts of packages to meet your requirements from corporate weekends to hen weekends to holiday clubs for children and school trip packages. You can even go there to stay in a small group, they have a lovely cottage on site. The location is epic, the centre is fantastic and the instructors are the bomb. If you are ever considering something like it, do what I did, say yes and enjoy every minute. Disclosure – we were invited on a complimentary blogger’s weekend for the purpose of this review. All opinions are honest and my own. You look like you had so much fun! I have walked in this area many times and you are right it is stunning. What an amazing opportunity! It looks like you all had an amazing time! I’m pleased that you gave it a go, as it is often when we think we won’t enjoy it that we have the best of times – and it looks like you both did too. So good to meet you and your little adventure! This looks like great fun. I remember going gorge walking in North Wales when I was a teenager and getting very wet! That is my kind of weekend! I love being outside and staying active and it looks like you had a great time! I’ve never heard of this place before, but wow looks like you had such an amazing time! This sounds amazing! What a fantastic experience, and looks like so much fun! wow what an amazing adventure, it sounds like a lot of fun. That looks like a fantastic place to do a bit of canyoning. It looks like some of the landscape in Vikings. This looks incredible! Looks like you had a great time. Wales always boasts really fun adventure weekends, they have such a rich countryside perfect for the outdoorsy type. Like you I’m not a self confessed outdoors girl but I would love to do everything you did on this weekend. Also love that you call your daughter bean, that’s why I call my daughter!